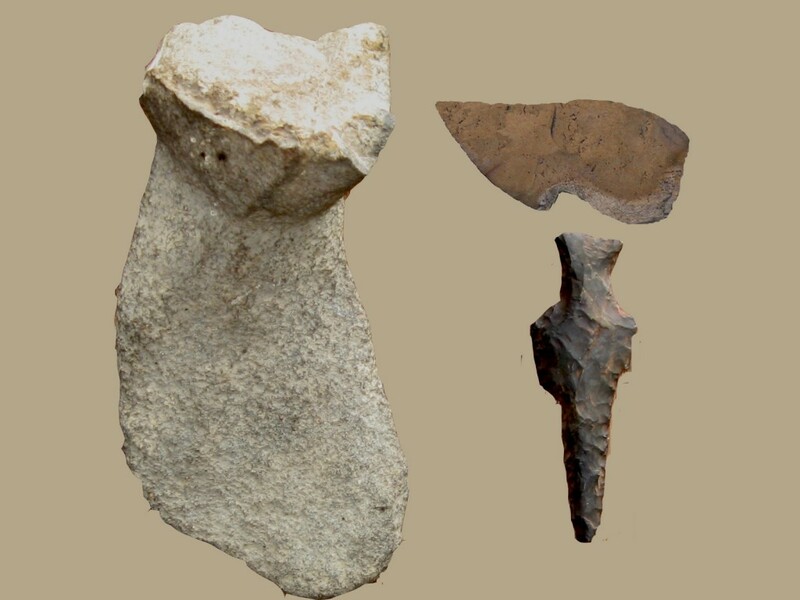 Archaeologists have established humans were living in rock shelters at the southern tip of South America between 12000 and 13000 B.C. …Monte Verde in Chile is dated at 12500 B.C. In Guns, Germs, and Steel, Jared Diamond noted, if Native Americans migrated southward from the Plains area of North America eight-miles per year, they would be in Patagonia within a thousand years. Based on this, the earliest arrival at the tip of South America by Paleo-Indians that crossed Beringia Land Bridge would be 10500 B.C.. If the 12500 B.C. dating of Monte Verde is correct, the only way migrating Paleo-Indians could reach there that early was by watercraft, or the Bering Strait Beringia migration was at an earlier period. A complex Indian society had developed in three small valleys one hundred miles north of Lima, Peru by 3000 B.C.. The Norte Chico civilization consisted of about thirty major population centers….Satellite photos and visual observations from airplanes are showing many large prehistoric Indian sites throughout South America. Norte Chico stretches from the Andes to the western coastline of central Peru. The Norte Chico area contains the oldest civilization in the Americas, and after Mesopotamia, the second oldest civilization in the world. The most notable of the Norte Chico cities, Cerel, was inhabited between 2627 B.C. and 2020 B.C.. Cerel was comprised of platform mounds, two plazas, an amphitheatre, and ordinary houses. The population is estimated to have been about three thousand. Radiocarbon dates show large-scale communal construction between 3200 and 2500 B.C. making it the second oldest civilization in the world The construction was characterized by monumental architecture, large circular ceremonial structures, and housing. One hundred and twenty-seven radiocarbon dates firmly establish a civilization thriving in the Norte Chico region. The Norte Chico area had multifaceted economies based on cotton, food plants, seafood, and trade routes between inland and coastal sites. The people of Norte Chico had wide-ranging trade with cotton at its center. Cotton was used to make textiles such as fishing nets, carry bags, and clothing. The oldest of these bags dated to 2627 B.C. Textiles were used to trade for seafood from the coast and agricultural products. Two items not found in Norte Chico sites were–ceramic pottery and Maize (corn). Mesoamerica, or Meso-America, is the area of central Mexico and the Yucatan Peninsula, Guatemala, Belize, and parts of Honduras. In the late Archaic period (Archaic Period ~8000 B.C. to 1000 B.C.) prehistoric groups in this area are characterized by agricultural villages and large ceremonial and politico-religious centers. Some of the most complex and advanced cultures of the Americas, and for that matter in the world, developed in Mesoamerica. Three fifth of modern day agriculture was developed in Mesoamerica. Key to the development of Mesoamerican Indian cultural centers was the development of corn…in Norte Chico seafood was the basic staple for the growth of cultural centers. 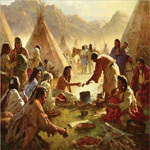 In order to develop cultural centers, a constant supply of food was required. Archaeological studies indicate that a form of maize (corn) was cultivated by 5600 B.C.. The origin of maize has been a subject of heated debate among archaeologists. Early evidence suggests maize originated as a cross between teosinte and gamma grass, but recent DNA studies have shown that corn under went mutations that softened the outer shell of the corn kernel allowing it to grow. Mutation accounts for the corn kernel growing not cross fertilization. 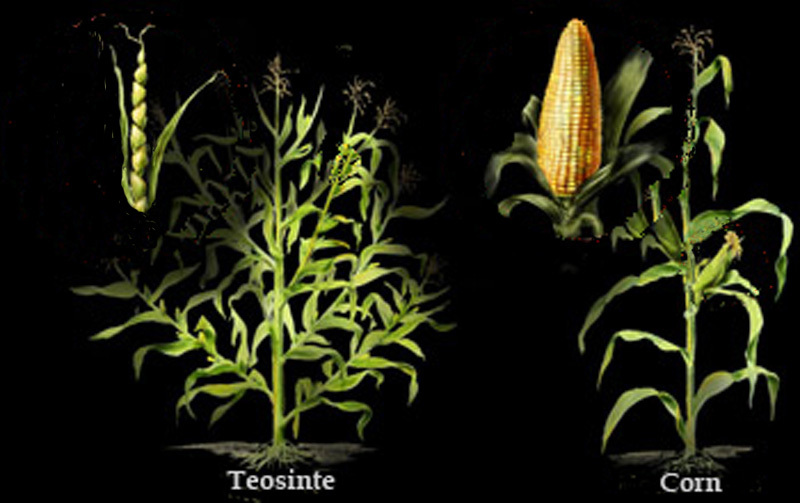 Corn does contain a small percent of Teosinte DNA. The first ears of maize were a few inches long and had only eight rows of kernels. Over the next several thousand years, the corn cob grew in length and size. Archaic Mesoamerican Indians grew maize, beans, and squash in milpas. Milpa agriculture consists of maize and beans being planted together in the same hole while squash is planted between the maize stalks. As the maize stalks grow, the bean vines wrap around the stalk. Squash covered the ground around the stalks to reduce the weeds and keep the soil cool and moist. Planted together these three plants became known down through American Indian history as the Three Sisters. 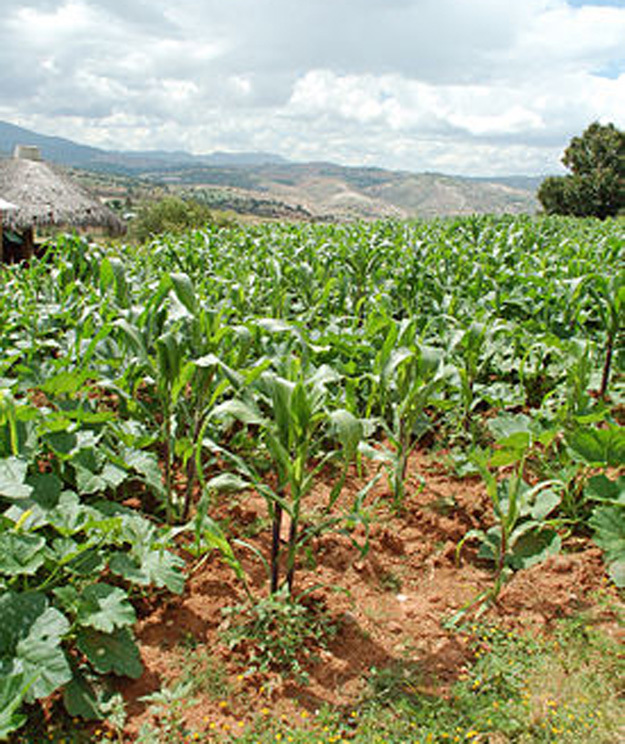 Milpa agriculture is a form of swidden agriculture which uses slash and burn to create new fields. Swidden agriculture is labor intensive with family plots between five and ten acres. The plants were scattered across the field, not in rows as corn is planted now….lack of rows made flood irrigation impossible, except in small areas. The majority of the Milpa fields were hand watered. Despite the nitrogen fixing properties of beans, corn depleted the nutritive value of the soil within a few years, and new fields were cleared for planting. Archaeologists put forth many reasons, especially drought, for the decline of Indian population centers. Environmental conditions often triggered the collapse of a culture, but the basic problem was North and South American Indians never acquired the technology to grow, transport, or distribute food to large numbers of people in concentrated population centers. Farmers with stone and wooden tools and no work animals could not produce enough food to sustain the ruling class, religious leaders, artisans, and laborers within the centers. A major reason for this was the Americas lacked animals that could be domesticated for work animals. The lack of work animals limited the ability of farmers to support large populations. When populations centers collapsed, many of the inhabitants died or were killed. The survivors returned to a hunter-gatherer lifestyle. Mesoamerican traders had spread into the North American southwest by the end of the late Archaic Period…Lekson states large migrations arrived around 1650 B.C., These migrants brought corn with them. Between 1250 and 1400 A.D., most North American Indians tribes had acquired Mesoamerican corn. After European contact with the Americas in the late 15th and early 16th centuries, explorers and traders carried maize back to their own countries, and from these areas, corn spread to other European countries. Three-fifths of the world’s agriculture comes from plants first domesticated by Mesoamerican Indians; they were the first to cultivate: corn, Irish potato, sweet potatoes, manioc, several varieties of beans, squash, pumpkins, peanuts, tomatoes, chocolate, rubber, long staple cotton, tobacco, and the use of rubber. At the present time, Maize (corn) originally from Mesoamerica is the most widely grown crop in the Americas. Olmec – The Rubber People 1200 B.C. to 400 B.C. The first to develop a complex society in Mesoamerica were the Olmec. 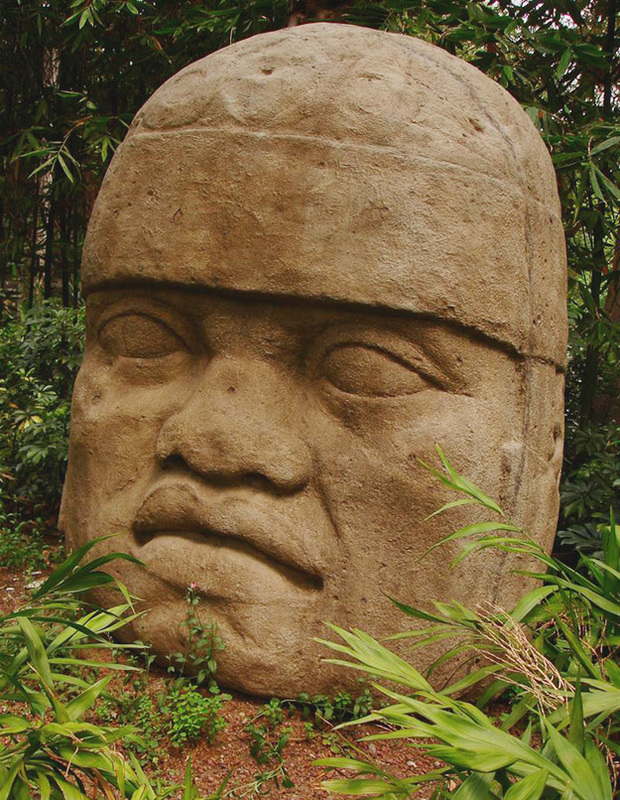 The Olmec lived in the tropical lowlands of south-central Mexico, roughly the modern-day states of Veracruz and Tabasco. Olmec sites include San Lorenzo, Laguna de los Cerros, Tres Zapotes, and La Venta. One of the greatest of the Olmec sites, La Venta, existed from 1200 B.C. to 400 B.C. The Olmec centers at La Venta, San Lorenzo, and Laguna de los Cerros were vibrant settlements with a ruling class, religious leaders, and artisans. Most of the Olmec population lived in small villages around the cultural centers. Olmec farmers practiced swidden (slash-and-burn) agriculture to clear the forests and shrubs, and to provide new fields once the old fields were exhausted. Olmec astronomers and mathematicians are credited with the invention of two basic calendars in addition to the use of the number zero. The concept of a number with no value is one of the most important concepts in scientific history…imagine a world without mathematics. A 260 day calendar had twenty months of 13 days each for agriculture and a 365 day calendar (long calendar) with eighteen 20 day months related to the solar year. Each calendar had specific day and month names and when combined on an interlocking wheel produced a 52 year cycle. Each 52 year cycle was equivalent to the modern calculation of a century. The Olmec had both a syllabic and hieroglyphic script. The script used by the Olmec is similar to the writing used by the Vai people of West Africa. Olmec tradesmen carved enormous helmeted heads out of stone blocks weighing as much as forty tons. Some archaeologists have suggested these are the features of Olmec warrior-kings. Seventeen of these heads have been found by archaeologists. Stone quarries for these massive heads were as far as eighty miles from the discovery locations. No two heads are alike, but the facial features are similar: flattened nose, wide lips, capping headpiece. The helmets are adorned with personal or group symbols. The Negroid characteristics of the stone heads have led to vigorous debates among scholars. Based on the facial features some archaeologists have insisted the Olmec were Africans who had migrated to the New World. However, the vast majority of archaeologists and Mesoamerican scholars reject any claims of prehistoric contacts with Africa. Many archaeologists consider the Olmec as the “mother culture” of Mesoamerica. The traditional view is the Mayan borrowed a number of sophisticated cultural practices, including mathematics, astronomy, and hieroglyphics from the Olmec culture. The Toltec and Aztec may not have descended from the Olmec, but were heavily influenced by the Olmec. Teotihuacán 100 B.C. – 700 A.D.
Anthropological and archaeology speculation about the Teotihuacán Indian culture is based on the city of the same name, Teotihuacán. The archaeological site of Teotihuacán is 30 miles northeast of Mexico City. Teotihuacán Indians did not develop a writing systems like the Mayan or Olmec. Instead, they developed a system of signs and notations that appear in their sculpture, mural painting, and decorated ceramics. The meaning and purpose of these symbols remain obscure. Archaeological evidence suggests Teotihuacán was a multi-ethnic city, with distinct quarters occupied by several different Mesoamerican Indian groups i.e., Mixtec, Zapotec, Toltec, and Mayan. The city of Teotihuacán had developed into a cultural center by 200 A.D. By 500 A.D., Teotihuacán was one of the largest cities in the world; the city covered 8 square miles with a population 125,000 people. Teotihuacán contained more temples than any other prehistoric Mesoamerican site. 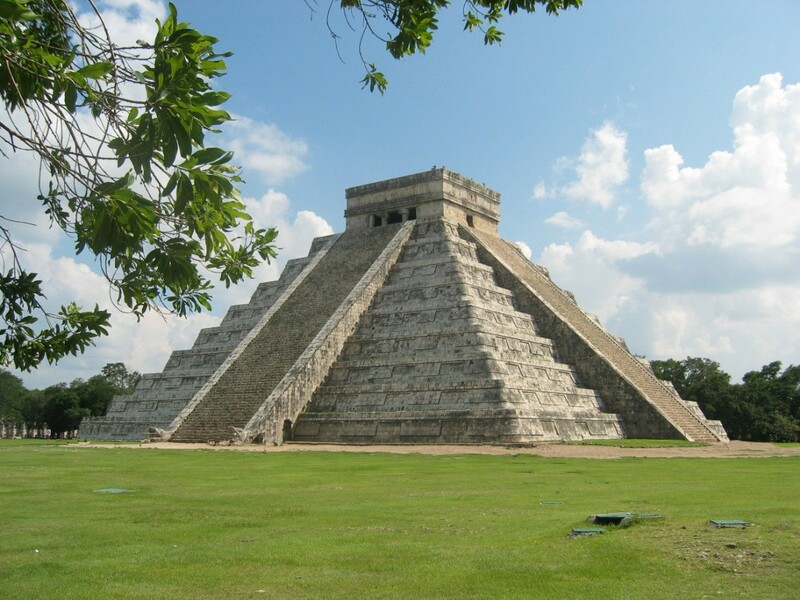 The Pyramid of the Sun, the Pyramid of the Moon, and the Temple of Quetzalcoatl were built for religious purposes. Avenue of the Dead – Teotihuacán ~ 600 A.D. Mounting evidence suggests the Teotihuacán Indians were involved in trade relationships as far away as the Mayan lowlands, the Guatemalan highlands, the Gulf Coast of Mexico, and northern Mexico. The Indians of Teotihuacán were the dominate force in Mesoamerica for about six centuries. 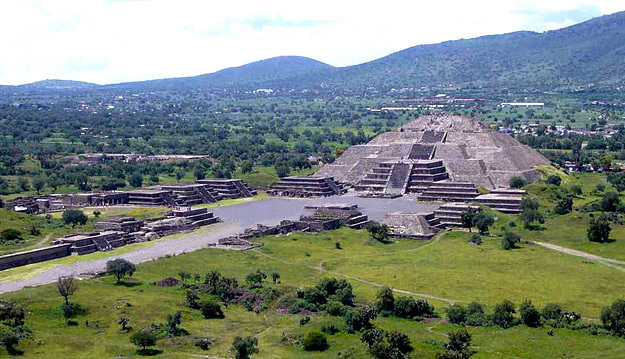 The Teotihuacán civilization was destroyed in what may have been a class struggle between inhabitants. Temples were burned and upper class homes and religious icons destroyed. The destruction of Teotihuacán appeared to be an effort to erase all evidence of the city’s culture. Outside forces may have been involved as well. 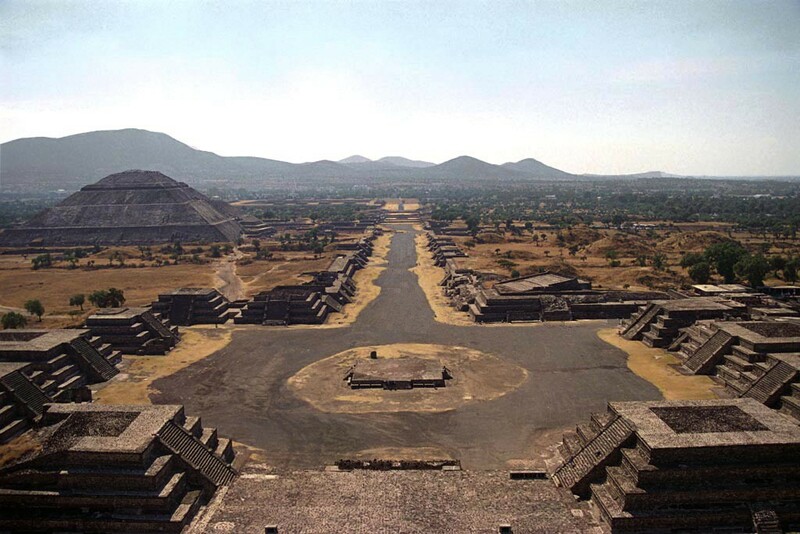 Teotihuacán was virtually abandoned between the seventh and eighth centuries A.D. The Toltec maintained they were the builders of Teotihuacán. Aztecs supported the Toltec claim, but the Toltec claim has not been corroborated by archaeological findings. The pyramids of Teotihuacán were uncovered by the Aztecs around 1000 A. D., and the Aztec adopted the ruins of Teotihuacán as their own. 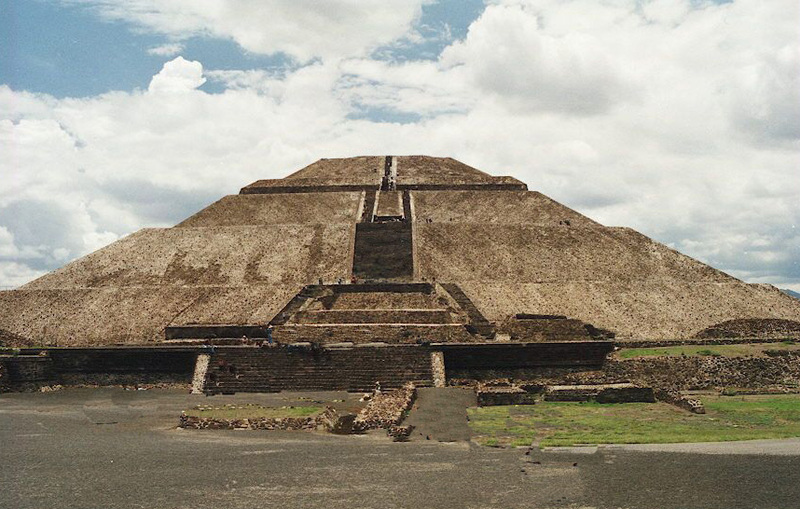 During Aztec period, Teotihuacán was identified with the myth of Tollan…the place where the sun was created. At the present time, Teotihuacán is the best known and visited archaeological site in Mexico. It is easy to confuse the name of the Aztec capital of Tenochtitlan with the earlier Teotihuacán. Zapotec 500 B.C. – 600 A. D.
The Zapotec lived on the relatively flat land in southern Mexico. About 500 B.C., the Zapotec built Monte Albán in the center of the Oaxaca Valley. Monte Albán was the earliest urban center in Mesoamerica. 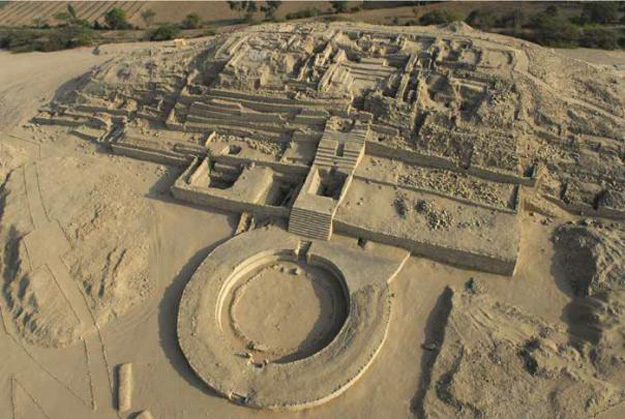 Monte Albán covered an area of 2.5 square miles and with a population of 25,000 inhabitants. Lasting for about a 1,000 years, Monte Albán became the dominant power in southern Mexico. 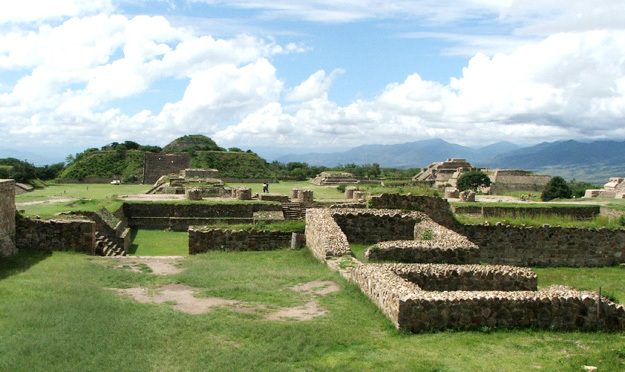 Monte Albán had the first centralized political system with the population divided into social classes. The Zapotec were ruled by nobles with a strong military force. Lacking a strong agricultural base, the Zapotec economy was based on collecting tribute from surrounding Indian groups. By the 7th century A.D. most of the Zapotec’s power was gone. Monte Alban – Zapotec ~ 500 A.D.
Trade was an important factor affecting growth and social change in Mesoamerica, as well as, North America. A merchant class developed regional trade markets. Objects of trade included food products, silver, gold, jade, macaw and parrot feathers, jaguar skins, cocoa, cotton, tobacco, and rubber. The Toltec Empire appeared in Central Mexico the 10th century with the establishment of Tula in the Hidalgo area. Many archaeologists believe the Toltec were refugees from the Teotihuacán culture and migrated to the Hidalgo area after the fall of Teotihuacán….it is an ongoing debate among archaeologists whether at any point in Mesoamerican history the Toltec formed an actual ethnic group. The Aztec believed the Toltec were scientists and artists who formed a society to explore and conserve the spiritual knowledge and practices of ancient cultures. Tula was the capital city of the Toltec. The ruins are forty miles northwest of present day Mexico City. 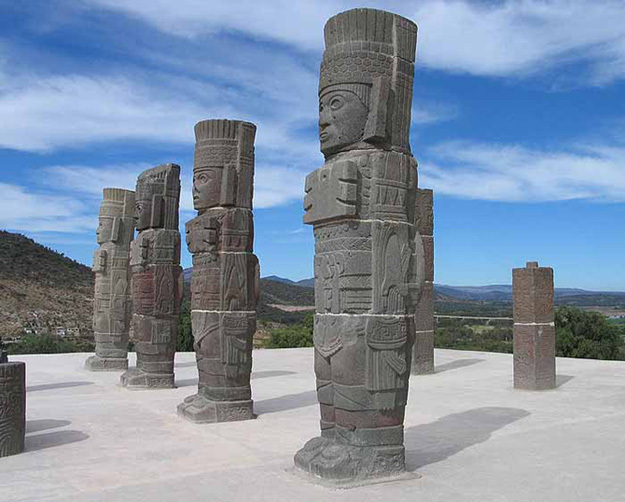 The city ruins are characterized by giant stone warriors placed at the Toltec temples. 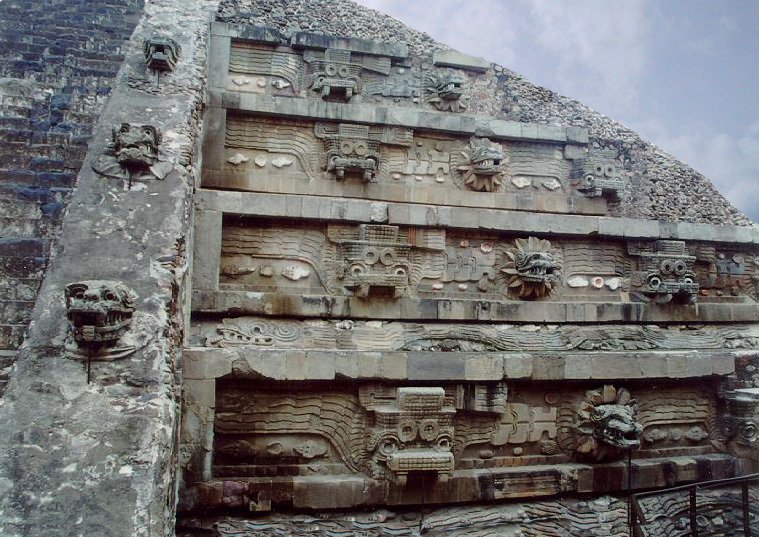 Tula rose to power after the collapse of Teotihuacan, and by the mid 10th century, controlled the valley of Mexico. Tula’s maximum size (40,000 to 60,000 people) and power was achieved between 950 A.D. and 1150 A.D. With a powerful military force, the Toltec spread across most of Mexico, Guatemala, and Yucatan Peninsula. Tula was at least partially abandoned by 1200 A.D. Aztecs plundered the Tula ruins for building materials for their nearby capital, destroying most of the historical evidence. Much of what is known about the Toltec comes from legends of other Indian cultures. Many future rulers of the other cultures, including Mayan leaders and Aztec emperors, claimed to be descended from the Toltec. After abandoning Tula, the Toltec integrated with the Mayan of the Yucatán Peninsula. Some archaeologists refer to the new culture as Toltec-Mayan with Chichén Itzá being the principal city. Chichén Itzá is located at the junction of the Rio Rosas and Rio Tula rivers. In the residential areas streets were laid out in a grid pattern. Distinctive Toltec features at Chichén Itzá included terraced pyramids, colonnaded buildings, and relief sculptures. Mayan culture originating on the Yucatan Peninsula around 2600 B.C.. The Maya rose to prominence around 250 A.D. in present-day southern Mexico, Guatemala, western Honduras, El Salvador, and northern Belize. 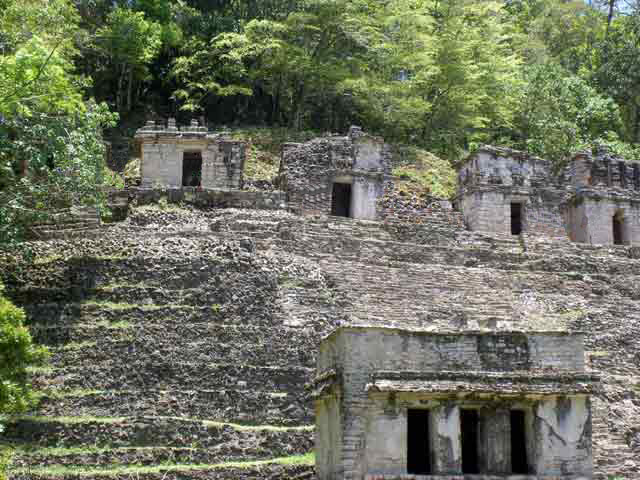 The most important urban developments occurred in the lowlands in the “central region” of southern Guatemala. 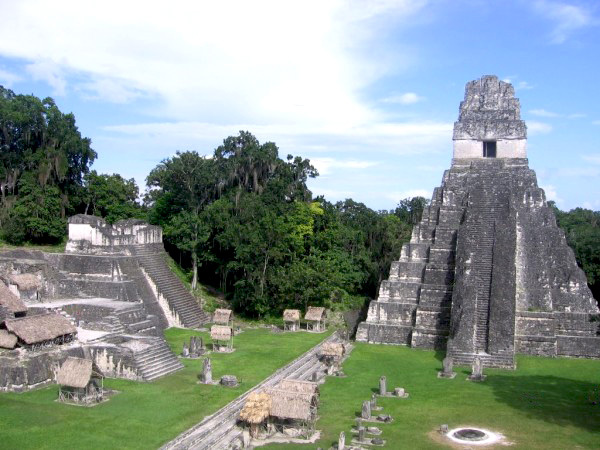 The principal city was Tikal, but the spread of urbanization extended south to Honduras; the southernmost Mayan city was Copan in northern Honduras. The Mayan existed in a multitude of separate states with a common cultural background–not a unified empire. The Mayan were a nation of politically sovereign states. Mayan cities were ceremonial centers–not urban culture areas. A priestly class lived in the cities, but for the most part, the Mayan population lived in small farming villages in a tropical rain forest. Mayans were skilled farmers, clearing large sections of tropical rain forest and, where groundwater was scarce, building sizeable underground reservoirs for the storage of rainwater…large cisterns stored water for the dry season. Tropical rain forests are poor agricultural land requiring a scattered population of farmers. The principal food of the Maya was maize. Maize production was the central economic activity of the Maya. By the ninth century A.D., Mayan lowland cities did not have sufficient agriculture to support the population and many Mayans migrated to the Yucatán peninsula. The Mayan were equally skilled as weavers and potters. Mayans are regarded as the inventors of many aspects of Mesoamerican cultures. Building on earlier civilizations, the Mayan developed a complex writing system, mathematics, and made astronomical observations. The Mayan’s complex calendar and hieroglyphics were based on the Olmec’s versions; archaeologists have not settled the relationship between the Olmec and the Mayan. The elaborate writing of the Mayan was developed to record the transition of power through the generations. The hieroglyphs were formed through a combination of different signs representing whole words or single syllables. Maya writing was composed of recorded inscriptions on stone and wood. Priests followed the ruling class in importance, and were instrumental in the recordings of history through hieroglyphs. The Mayans raided their neighbors for land and captives. Some captives were subjected to a double sacrifice where the victims heart was torn out for the sun and head cutoff so the blood could nourish the earth. Wars were fought between rival Mayans groups over territory until the region was conquered by the Spanish. Mayan cities were in to decline when the Spaniards arrive in the Yucatán Peninsula. At the present time, millions of Mayan descendants reside in Mexico, Belize, Guatemala, Honduras, and El Salvador; they speak the Mayan language and observe its rituals. The Aztec and Inca were the last two great civilizations in Mesoamerica and South America; they were destroyed by Spanish Conquistadors searching for gold and silver. 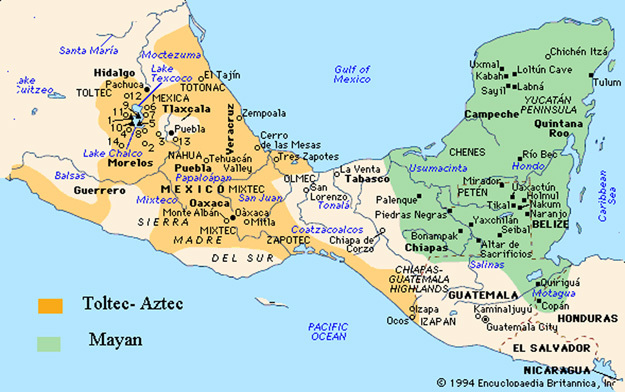 The Aztec established Tenochtitlán in central Mexico around 1300 A.D. The Aztec culture flourished for two-hundred years before Hernán Cortés and Spanish conquistadors arrived in 1519. Within two years, Spanish conquistadors and European disease had destroyed the Aztec Empire. With the capture of Tenochtitlán in August 1521, the Aztec Empire was gone. Cortés renamed Tenochtitlán, Mexico City. Fernando Pizarro with 106 foot-soldiers and 62 horsemen attacked the Inca army in the Battle of Cajamarca in November,1532. Pizarro captured the Inca ruler, Atahualpa. Despite Atahualpa filling one room (22 feet by 17 feet ) with gold and two with silver, Atahualpa was garroted in July, 1533. Pizarro sealed the conquest of Peru by taking Cuzco in 1533. In less than a year, Pizarro and Spanish conquistadors, aided by European disease, destroyed one of the greatest empires in the world. Spanish conquistadors and European diseases destroyed the Aztec and Inca empires marking the end of over 2,000 years of the greatest cultures in the Americas…some of which rivaled the greatest cultures of Europe. The actual number of American Indians killed by European disease is unknown–but in terms of percentages, the number killed could approach seventy to eighty percent. Of the European diseases, smallpox was the most deadly. The Mesoamerican article was written by Ned Eddins of Afton, Wyoming. Gallenkamp, Charles. Maya The Riddle and Discovery of Lost Civilizations. Viking Penguin, Inc. New York, NY. 1985. Lekson, Stephan H. A History of the Ancient Southwest. School for Advanced Research Press. Santa Fe, New Mexico. 2008. Mann, Charles C. 1491 New revelations of the Americas before Columbus. Alfred A. Knopp. New York, NY. 2005. Schele, Linda and Freidel, David. The Forest Of Kings: The Untold Story of the Maya. William Morrow and Company, Inc. New York, NY. 1990.